The Severn Estuary Forum met for its annual meeting 2017 in Bridgwater, Somerset on the 5th October following hard on the heels of Question Time and the Antiques Road Show at the McMillian Theatre. An event to see people working together to resolve climate change, flood risk and wildlife preservation it was not. Richard Hickmet the High Sheriff of Somerset opened proceedings. The day was split into three sessions and some notes on the highlights follow. Session Chair SDC councillor Ann Fraser MBE introduced the session noting the increased trade (marine aggregates) going through Dunball now rising to 70,000T per year as a reflection of increasing economic trade. Fortunately, Ross Edwards in his following update on Hinkley Point C (HPC) noted that their aggregates jetty being built as part of the enabling works was still underway. The real reason for Dunball’s growth was more to do with HPC immediate need rather than some wider reason. The irony of the councillors assumptive claim was not lost. Ross Edwards (EDF) was able to explain, whilst maintaining a serious face, the extreme lengths that EDF were going to protect the beach from the small feet of a jack up barge and a few discreet foundations. Yet another large corporate organisation feeling the need to succumb to the irrational demands of the modern environmentalist. He also noted that EDF had spent £20M on road improvements as part of the HPC project enabling works. Dr Judith Wolf of the National Oceanography Centre in Liverpool provided a fascinating talk that actually dealt with the session subject. The moderating impact of the edge of the continental shelf in dissipating energy should make us all worry a little less about that large piece of a volcano that threatens to slide into the sea in the Canaries at La Palma causing a tsunami. The great flood of 1607 also got a brief note and it was not a tsunami. What was more important was Dr Wolf’s comments on global warming and the best scenario of sea level rise being 0.5m and the worst at nearly 2.0m. Dr Wolf confirmed they really don’t know the figure as no one knows how the melting polar ice caps will impact on the world. It was received with little or no comment. 2.0m is around twice the figure that the EA is using for the Bridgwater Tidal Barrier (BTB). 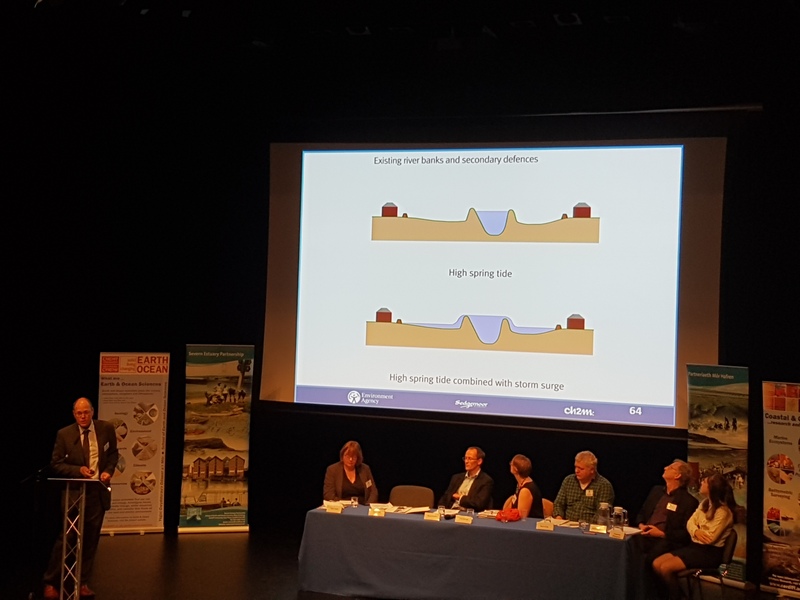 Andy Hohl (EA) project manager of the Bridgwater Tidal Barrier project explained the mechanism of the floodgates but avoided the mechanism of the planned flood defence system. A diagram was shown showing the planned flooding of Chilton Trinity and Pawlett Ham’s when there is coincident high tides and storm surges. It is an event that will increase in intensity and frequency as sea levels rise and after a few events will have poisoned the land. The EA missed the opportunity to explain why a tidal barrier is to be built in Bridgwater rather than the conventional locations at the mouth of rivers such as at Newcastle and Barking. Mr Hohl was asked what comes after rising sea levels makes the Bridgwater Tidal Barrier ( gate and river banks) ineffective in protecting the area from the sea. Apart from some irrelevant comments about things being done today, there was no answer about tomorrow. Tomorrow, if Dr Wolf is correct, will be only 50 and not 100 years away before a replacement solution is needed. Wessex Water’s Lucy George gave an interesting talk on the construction of the new sewers being built around Bridgwater. Clever engineering in bad ground. Alys Lavers the WWT manager at Steart gave an update on the last 3 years entitled Climate Change, Flood Risk and Community Action. It has obviously become a go to place for students studying for degrees and PHD’s. Even some elver’s have apparently decided it’s a great place deciding that the swim to Oathe and the freshwater rivers of the Tone, Yeo, Parrett and beyond was simply not worth the effort and turned right into the Steart reserve. Whether that was in the EIA and is safer than getting past the locals elvering is no doubt a study in itself. However a look at the IDB asset map apparently showing every route to freshwater blocked by a clyce does not paint a promising future for the lost elvers. Ms Laver was also remarkably candid about Steart. That there would be no facilities built there apart from the existing toilets. No chance of a place to shelter from the elements and have a cup of tea. Little chance then that Steart will deliver the promised economic contribution when planning permission was sought by the EA. Someone in the audience from Burnham on Sea said it was difficult to find and Ms Laver explained that the lack of signposting was deliberate. Apparently keeping the number of visitors down was done for the benefit of the locals. What was apparent to many in the audience was that WWT Steart is really only interested in the right sort of visitor; academia and other suitable people. The ordinary taxpayers who paid for Steart from their taxes (that is where the EA get its money from) most definitely not welcome. Rob Shore WWT, session chairman and coordinator of the Severn Vision introduced the document that was first published in January 2017. What is interesting is the ambition of this recent document. 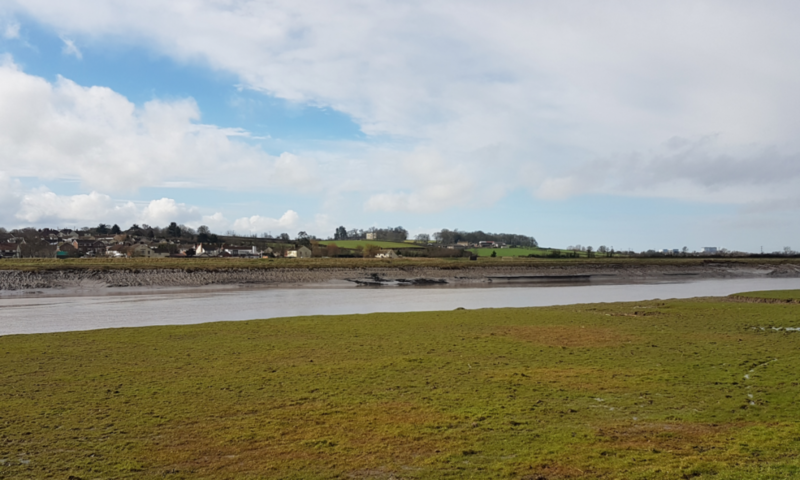 A saltmarsh from Dunball to Highbridge. The proposal outlined in this document is clearly in line with the EA’s and SDC’s current strategies set out in the Shoreline Management Plan and Parrett Estuary Flood Strategy. 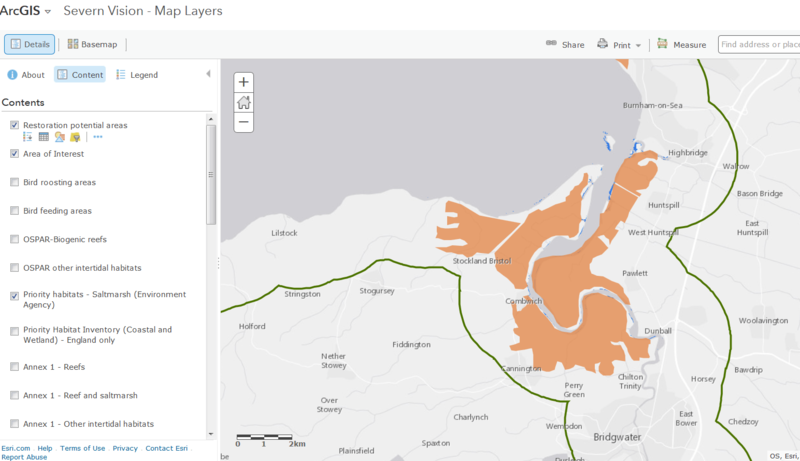 The map below was generated from the Severn Vision interactive map. If you live around the Severn Estuary its worth checking out the aspirations of the various wildlife organisations. One cannot help but feel that the EA and various wildlife organisations including WWT have the ambition to turn the coastal part of Somerset into a wildlife theme park. Trading off the land in Somerset for planning gain elsewhere such the Bristol Ports deal where Bristol gets the economic benefit and people in Somerset beyond made to feel to feel uncomfortable in their own countryside is unacceptable. Climate change should not be used as little more than a Trojan Horse by organisations with an overblown sense of morality and entitlement. A question on the morality of an island that cannot feed itself flooding food producing farmland to create saltmarsh was quickly pushed to one side. Finally a question about mitigating the noise from exploding old military ordnance being found as part of the HPC outfall construction work. Ordnance, when located, is subsequently blown up by the Navy’s bomb disposal team; it did not find someone willing and able to answer it. What was quite clear was climate change and rising sea level is really only a device and agenda for wildlife organisations to pursue the expansion of wildlife habitat. There was no big picture presented, no key numbers and no one to provide context as to how the wildlife of the Severn Estuary, ordinary people and business might co-exist. Key local councillors present on all the flood committees, Wessex, the drainage boards and the SRA were with the exception of Ann Fraser notable by their absence. Perhaps there were no expenses paid for attendance. Councillor Fraser it was noted in the Speaker Summaries although not an engineer had been “instrumental in leading a technical review of the flood risk in Bridgwater”. The Somerset Rivers Authority is no better with regard to engineering. There is a disturbing and dangerous precedent of non-qualified people in influential positions shaping Somerset’s flood and climate change plans. Google and mobile phones do not make an expert. There is simply no leadership or vision when we should be looking forward not 100 years but perhaps 2 to 300 years. Sea level rise is not stopping and schemes such as the Bridgwater Tidal Barrier that just look forward 100 years and stop with no apparent reason defy reason and responsibility; what is the plan afterwards? there isnt one. Perhaps worst of all for an event sponsored by my own institution, the Institution of Civil Engineers, there were no engineers representing the many companies making money from climate change. Engineer’s created the landscape we have and the current generation should be leading process of planning for our future but seem to have abdicated their interest or responsibility in shaping the land bordering the Severn Estuary. Somerset and the other counties of England and Wales that border the Severn Estuary need to have a serious conversation and take control of climate change issue at a regional level. The situation needs a champion with authority and knowledge. Next PostNext Sedgemoor, will the HPC community monies provide a real legacy?